Consumer Village Reviews - Legit or Scam? Consumer Village Reviews – Legit or Scam? According to Gongos.com, “leading manufacturers and Fortune 500 companies rely on Consumer Village to help develop new products,” by taking not only the consumer survey results into account, but also the forums available to members of the Consumer Village. The forums on Consumer Village act as a place for the free exchange of consumer ideas on products, product improvements, or other consumer issues that they hope will be addressed by manufacturers and distributors. 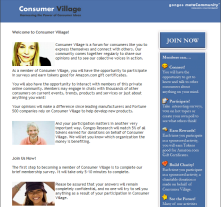 To join Consumer Village, you must fill out a brief membership questionnaire, which takes between 5 and 10 minutes to complete. This questionnaire asks questions regarding your gender, age, employment, educational level, racial background, whether you have children or pets, and even more. This questionnaire is necessary, because often manufacturers and companies are looking for input from a very specific demographic to whom they are looking to market and filling in this survey completely will result in you having better survey opportunities. After you become a member, you will be invited to take surveys and join product panels. When you complete either one of these, you will receive tokens which can eventually be exchanged for Amazon.com gift cards. First, Consumer Village is entirely free to join – you will never be asked to pay a fee to participate in their surveys and panels. This is very important, because a market research company should never ask you to pay them to take surveys. Second, Gongos Research promises that your information will be completely confidential. They will not sell your information to third parties, nor will anyone try to sell you anything as a result of providing them with your personal information. Finally, Gongos Research will also match 5% of all tokens earned for charitable donations made on behalf of the Consumer Village. But, as always, potential members should remember that paid surveys are simply a way to earn some nice rewards or extra cash – not to replace your day job. Average Rating for " Consumer Village " is 0 out of 5 based on 0 reviews. how do i get the questionaire to join please?